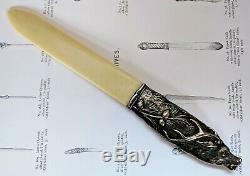 Austrian Art Nouveau Alpacca & Celluloid Letter Opener. 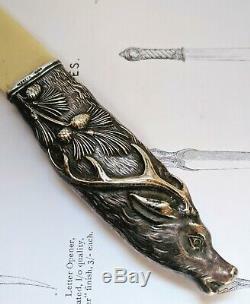 With handle made out of Alpacca formed as a deer head and blade made out of celluloid. Marked where the handle meets the blade with "ALPACCA Hoka". Only light use of wear. No damages neither to blade or handle. Length approx 22.5cm (8.8in). 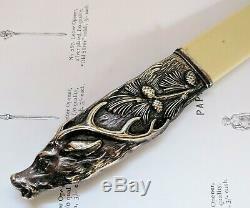 The item "Beautiful Early 20th c. Austrian Art Nouveau Alpacca & Celluloid Letter Opener" is in sale since Saturday, March 2, 2019. This item is in the category "Collectibles\Pens & Writing Instruments\Desktop Items\Letter Openers". The seller is "vernersnol" and is located in Riala. This item can be shipped worldwide.